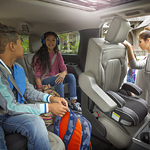 When it’s time to buy your next vehicle, we at Doug Smith Kia want you to be an informed driver making a purchase based on having all the facts. If you’re like many vehicle shoppers, you may be considering buying an SUV. More and more drivers are choosing to buy SUVs today. Want to know why? Here are a few of the many reasons. • SUVs offer a smooth ride. • They get good gas mileage. • They carry more cargo. • They carry more people efficiently than cars. • SUVs are ideal for transporting pets. • SUVs are safer in winter or bad weather conditions like flooding. • SUVS are great vehicles for towing your favorite toys. • SUVs offers some great off-roading adventures. • They offer command seating positions so you can see the road ahead of you better. Give us a call or stop at our showroom in American Fork, and take an SUV out for a test drive.